The flower groups organises flowers in both Churches. Members of the congregation can either give a personal donation of flowers or donate money to the flower funds. Members of the flower group will then supply flowers to decorate the Church throughout the year. 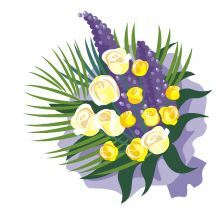 At the end of each service, the flowers are distributed on behalf of the congregation to church members who are ill or unable to attend Church. It is a great comfort to those members to know that others are thinking and praying for them at what may be a difficult time in their lives. The congregation enjoys the flowers and donations are greatly appreciated. There is a flower diary on the notice board at both Churches where your name can be added if you wish donate flowers on a special date. Please approach any member of the Flower Groups to arrange this for you or, if you know of someone who would benefit from receiving flowers, please speak to a member of the Flower group.